The weather cooled significantly here in England recently and the sky cleared for a couple of days. I was able to get this picture of Jupiter on Saturday night. I captured 4000 frames using my Orion SPX 250 telescope and used Registax 6 to stack the best 1400. The image was enhanced using that program's wavelets, and further tweaked using The Gimp. Just off the edge of the disc of the planet in this picture is Jupiter's moon Ganymede, That is the third moon out from Jupiter and was one of the original four identified by Galileo. Ganymede orbits in about 7 days. It's been a while since I imaged the sun. The last time was in fact the ISS-Crossing in August 2010. 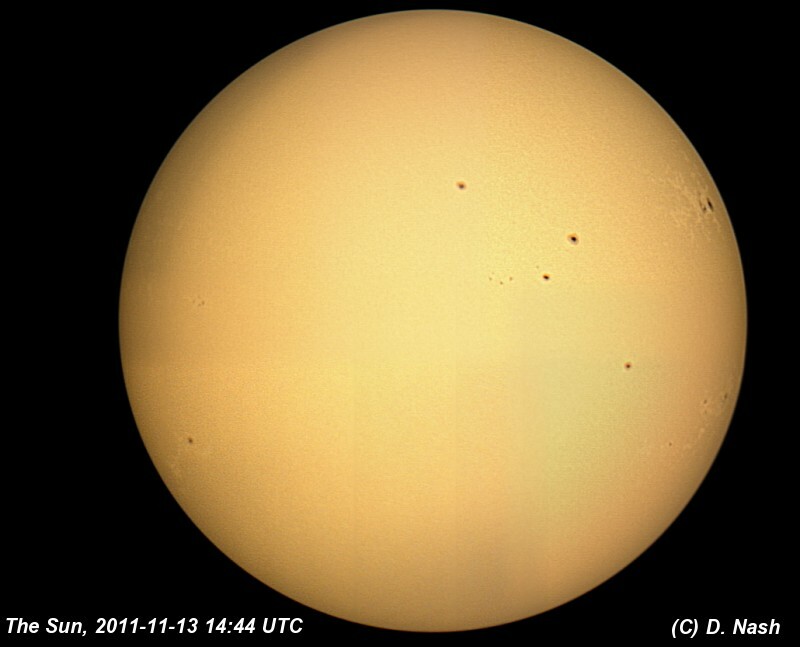 Today the sun is much more active than back then, and there are quite a few spots on the sun. 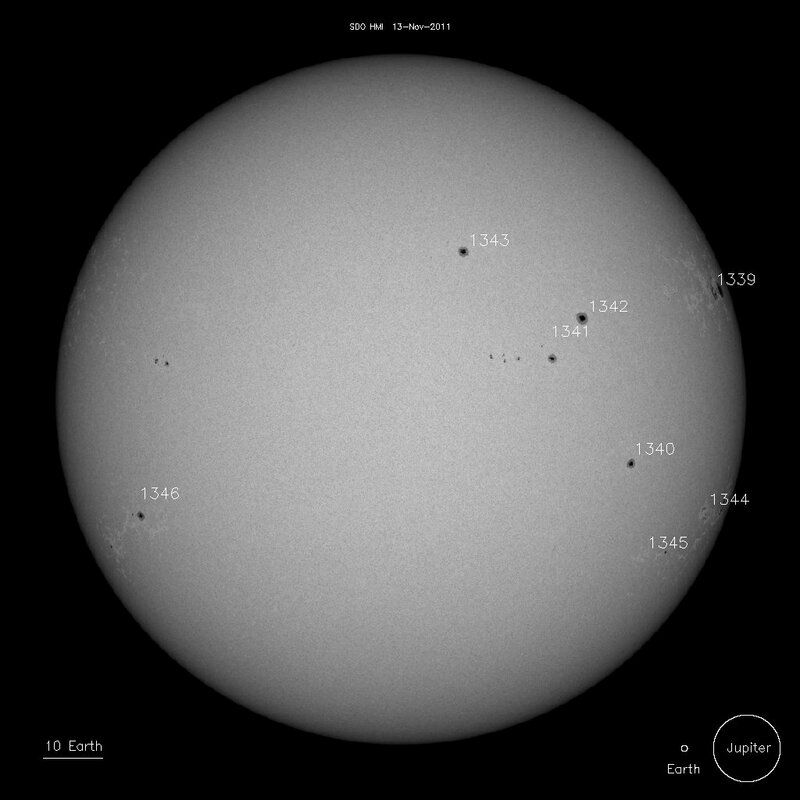 To identify all these sunspots I looked at This Image from the SOHO daily image which revealed that Active Regions 1338 to 1346 are visible in this image. 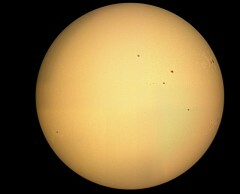 The picture was captured using the TouCam Pro at prime focus of my Megrez 80 Super Apo telescope (fitted with a filter made with Baader solar film), which results on a bigger image than the camera sensor, therefore this is a composite of four separate images, each stacked and sharpened in Registax 6 and put together using IMerge. 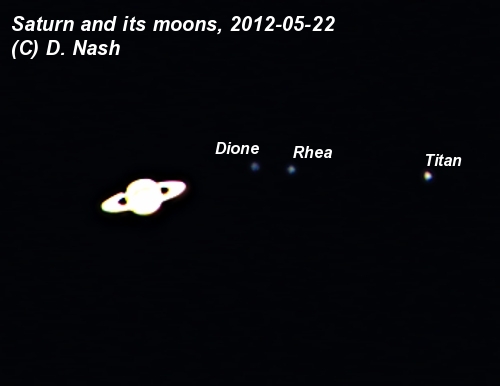 The image is not perfect and there are some artifacts of the slightly cloudy sky and of the imaging process. The colour is as it came from the camera, which for Baader-filtered images should normally be monochrome, but which came out as a pleasing sun-like colour. After a lot of cloudy nights, I got a clear sky before the fog came down on this November night. 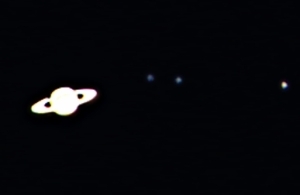 I captured three sequences of frames using my TouCam Pro and this was the best after stacking in Registax and processing with The Gimp. Click the picture to see it full-sized. In this picture you can see various details in the clouds including the dark spots in the northern equatorial belt and what looks almost like another spot next to the GRS. It is interesting to compare this with this earlier image to see the development of that cloud feature. 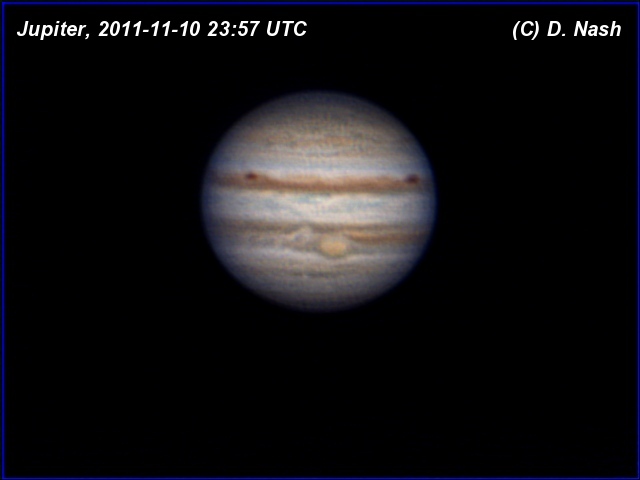 You have probably seen many images of Jupiter with the Great Red Spot prominent. This huge storm has been raging for hundreds of years (it was observed in the 1600s) and is large enough to fit the entire planet Earth within it. However most of my images in this blog so far have not included the GRS. Why? Timing. 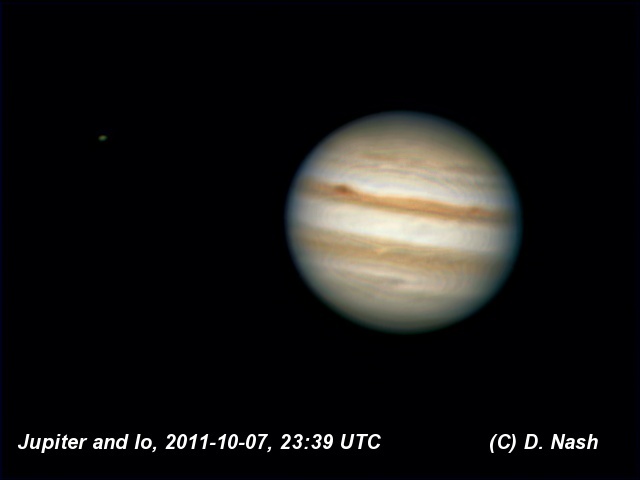 Jupiter rotates once every 9.9 hours and you have to catch it at the right time to get a decent image of the red spot. Tables of GRS transit times, the times when the spot is visible in the centre of Jupiter, are published, or you can use a page such as this one to calculate when the GRS will next be visible. 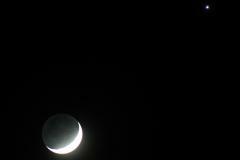 Last night I was prepared for the moment of transit and captured three sequences at various camera settings. The best was this one, using the TouCam camera at 15fps with 1/33sec exposure time. 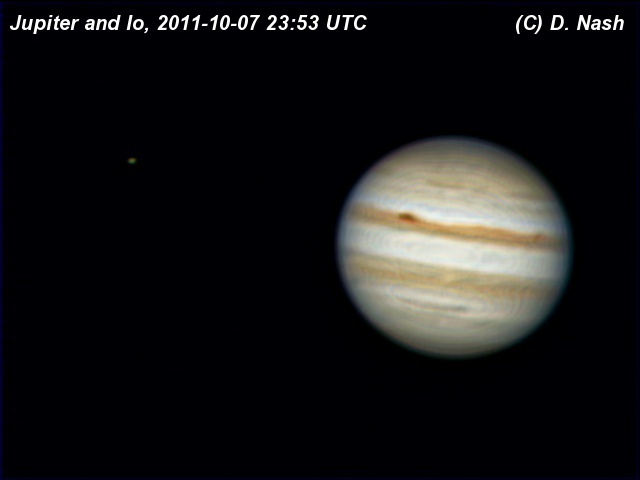 The innermost moon Io is also visible, as it often is in these images. Click the picture to see the full sized image. No...not that Jupiter and Io but the planet and its innermost moon. 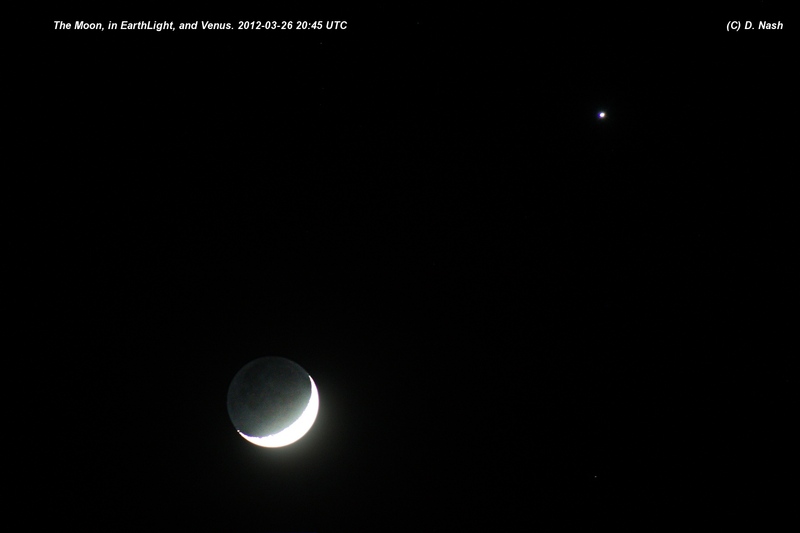 These two pictures were taken within 15 minutes of each other a few days ago on the night of 7 October. Click the pictures below to see them in full size. Each one is the result of stacking 3000 webcam frames captured with K3CCDTools. 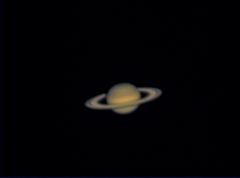 I stacked them in Registax 6 and processed further with The Gimp. Some artifacts of the capture and stacking process can be seen around the edges...the infamous "ringing" that often shows up in stacked images of Jupiter. However plenty of genuine detail did show up on this occasion. 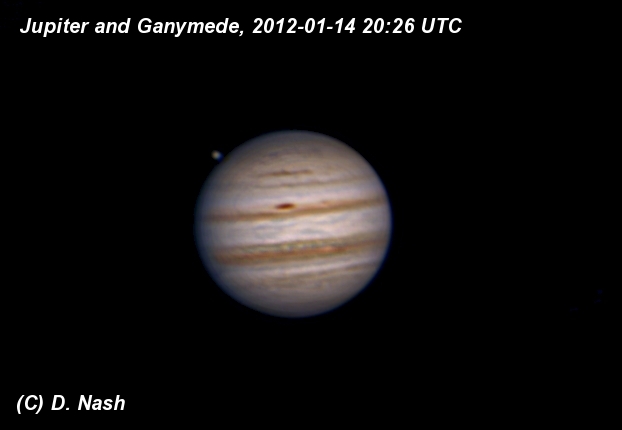 Captures of Jupiter have to be done in a short time due to the fast rotation of the planet. You can see the movement in the two images above. Capturing for too long a time would result in blurred pictures. For the same reason, the USB 1.1 webcam is best at 15 frames per second, allowing more frames to be captured (and therefore a better result after stacking) than using potentially higher quality but fewer frames when capturing at 5 fps. My captures were limited to 3000 frames at 15fps which takes 3 minutes, limiting the motion due to rotation to a tiny amount. It may be a long time since I got a decent image of Jupiter (see previous blog entry) but it's even longer since I did one of these. A mosaic of the lunar surface. 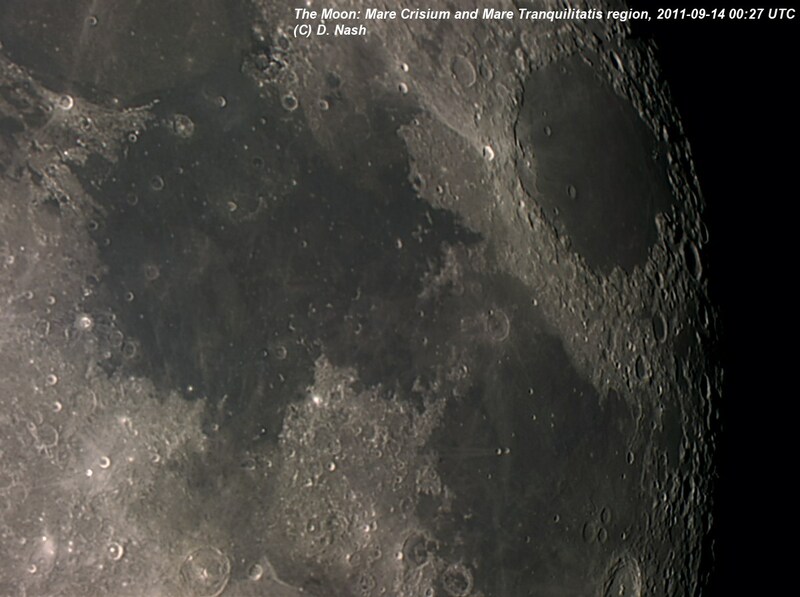 This image was composed of four sections covering Mare Tranquilitatis, Mare Crisium, Mare Fecunditatis, and part of Mare Serenitatis. For each part I captured and stacked 1000 frames using a TouCam Pro on my Orion Optics SPX 250 telescope. Stacking was done in Registax 5, and the mosaic was put together in Jon Grove's relatively ancient but still excellent iMerge. Click the image to see the full picture. 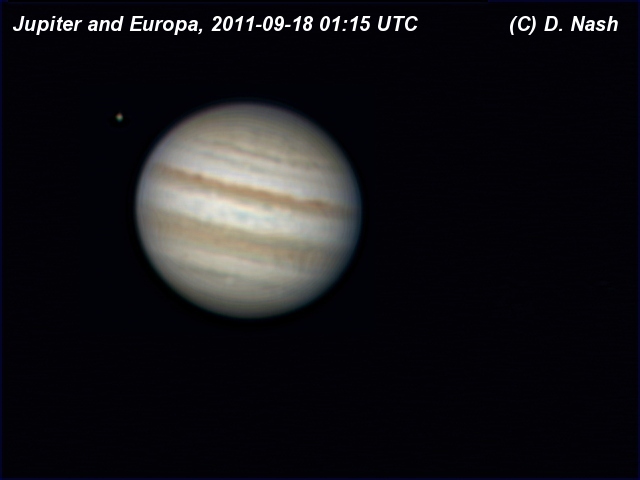 After a long gap, I have made a reasonable picture of Jupiter again, and with the Galilean satellite Europa, too. 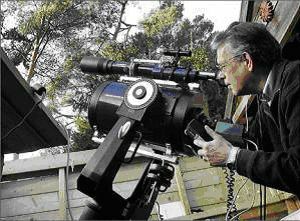 I have had a few tries recently but the weather here has been pretty bad and even when it was clear it was very windy, leading to very bad astronomical seeing. 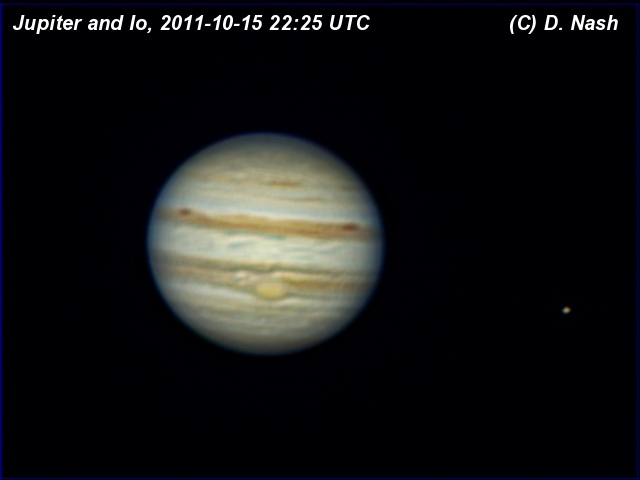 I captured this one on the night of 17 September, actually it was 18 September by the time Jupiter was high enough. I captured 4000 frames and stacked 1200 of them in Registax 5, with some final finishing in The Gimp. Click the image above to see the full photo. This picture was captured using my Orion Optics SPX 250 Newtonian telescope on my new mount, a Losmandy GM-8, of which more later.